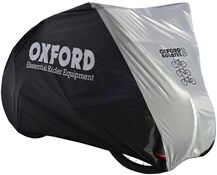 The Oxford Aquatex bike cover keeps your bike dry and protected from the elements. You get three sizes to choose from to fit one, two or three bike frames. 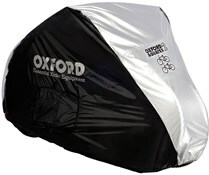 The Aquatex is great for if you don’t have the room to store your bike in a garage or shed. Oxford's Aquatex bike cover is made from tough 100-denier polyester which is double-stitched for strength and durability. When you're not using it, it folds up into a compact package for storage. My wife and I own hybrids with the longest of our handlebars measuring 620mm. The 2 bike cover is nowhere near wide enough to cover our bikes, which is disappointing as it is not advertised for road bikes alone. Wish I had not bought it. These covers were purchased to go over two electric bikes to keep them safe really when we travel away and there are no cycle sheds or facilities. We are pleased with them, they cover the bikes well and hopefully they will be strong enough. So far so good. Certainly does the job as a good dust and dirt/crap cover when stored away garage etc. 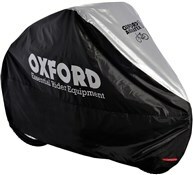 I did buy the larger two bike cover and found for my hybrid bike it was the perfect size. If used outside i would definatly recommend extra tying down in windy conditions. I have a bike with 32 inch frame & this super cover fits over it all. It's weatherproof, fits nice & snug over the wheels & is very easy to use. Excellent product & a fair price too. Delivery was also prompt. Even though I reside in Spain it was cheaper for me to purchase this item in the UK... and it was delivered to my rural address within no time. Excellent. The 1 Bike cover fits snugly over my mountain bike. The fit is tight over the wheels and so far this has not blown of in the wind. Has kept my bike completely dry so far through some fairly wet weather. I was keeping my and my son's bikes under the stairs and needed a better solution. This was the ideal buy. The quality is excellent. So far, I've only kept my bike under it, but it serves wonderfully that way - sure it will be even better with son's bike. It's just a little fiddly to put on, but taking it off is a breeze!